From the proud quirkiness of SoCo to the quiet residential community of North Shoal Creek; from the urban bustle of Downtown to the natural beauty of Barton Creek and the breathtaking hill country views of Cat Mountain - no matter what kind of locale you'd like to call home, chances are there's a area of Austin that's just right for you. Then, once you're actually here, we encourage you to explore a handful of neighborhoods that appeal to you. Whether you end up staying for a few months or a few decades, you'll soon be writing your own chapter in the continuing story of our city. 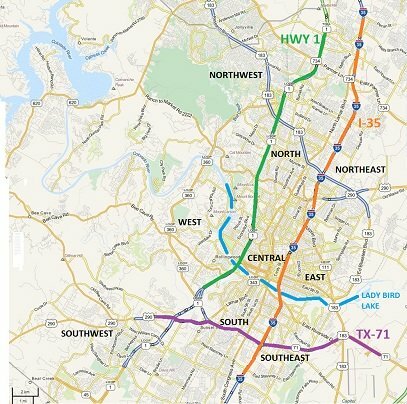 For a mid-sized town, Austin presents many choices of where to live. It can get confusing and maybe overwhelming. The table below offers some suggestions on areas to begin your search, depending on your situation and preferences.